According to a report published earlier today, Adobe will be pulling support for Flash on browsers for mobile devices. The news comes from ZDNet – a business and technology news website – in the form of a report in which they cite “sources close to Adobe” who claim that they have been briefed on the company’s future plans. The most notable bit about these “plans” being how Adobe is reportedly looking to stop further development of Flash on browsers for mobile devices such as Android and PlayBook. The sources sent a “forthcoming announcement” to ZDNet in which Adobe states that their focus from now on would be on their newer AIR technology instead of Flash and that Flash will no longer be adapted for browsers on new mobile devices or new OS versions. This is while current Flash for Android and Blackberry Playbook configurations will continue to see bug fixes and security updates (but not new features). Well, that sure was unexpected. One of Android’s most advertised features of 2010 was how the OS is “open” and offers “the full web” since over 75% of rich media on the internet was made and displayed in Flash. It was, then, being marketed as an exclusive feature, one that iOS users were sorely missing. The whole Adobe vs. Apple topic was one of the hottest debates of 2010. Adobe wanted to push their multimedia platform beyond the PC while Apple saw it as an outdated technology unsuitable for low-power mobile devices, susceptible to malware, unreliable and poor in performance. Adobe eventually released Flash Player 10 for Android while Apple declared that Flash would never be made available for Mobile Safari. The story now ends with Adobe ceasing development of Flash for browsers on mobile devices and Apple, or more specifically Steve Jobs, winning the debate. 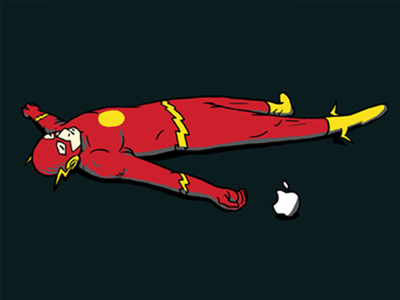 Apple was really right in the end as currently, despite seeing heavy development, Flash for Android is still a mess. Even on the highest-end of devices, its performance is mediocre at best. On my Samsung Galaxy S II, Adobe Flash is set to run “on demand” and, honestly speaking, it never really gets any demand from me since the most popular websites and services support HTML5 – an open, secure and better performing alternative to Flash – which, in turn, is well supported by the modern mobile browsers such as Android’s stock browser and iOS’ Mobile Safari. Update: To make things more official, Adobe has posted an article on their blog; officially acknowledging the death of Flash on mobile device, and diverting focus more towards HTML5.